A New Hampshire judge has ordered Amazon to turn over two days of Amazon Echo recordings in a double murder case. Prosecutors believe that recordings from an Amazon Echo in a Farmington home where two women were murdered in January 2017 may yield further clues to their killer. Although police seized the Echo when they secured the crime scene, any recordings are stored on Amazon servers. Amazon is also directed to turn over any “information identifying any cellular devices that were linked to the smart speaker during that time period,” the order said. Timothy Verrill, a resident of neighboring Dover, N.H., was charged with two counts of first-degree murder. He pleaded not guilty and awaits trial. 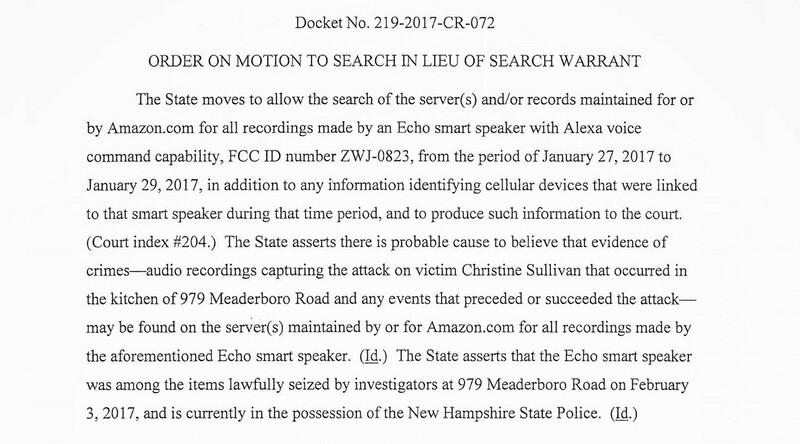 New Hampshire doesn’t provide electronic access to court records, so it’s not readily known if Amazon has complied with the order, signed by Justice Steven Houran, on November 5. It’s not the first time Amazon has been ordered to turn over recordings that prosecutors believe may help a police investigation. Three years ago, an Arkansas man was accused of murder. Prosecutors pushed Amazon to turn over data from an Echo found in the house where the body was found. Amazon initially resisted the request citing First Amendment grounds — but later conceded and complied. Police and prosecutors generally don’t expect much evidence from Echo recordings — if any — because Echo speakers are activated with a wake word — usually “Alexa,” the name of the voice assistant. But, sometimes fragments of recordings can be inadvertently picked up, which could help piece together events from a crime scene. But these two cases represent a fraction of the number of requests Amazon receives for Echo data. Although Amazon publishes a biannual transparency report detailing the number of warrants and orders it receives across its entire business, the company doesn’t — and refuses — to break down how many requests for data it receives for Echo data. In most cases, any request for Echo recordings are only known through court orders. In fact, when TechCrunch reached out to the major players in the smart home space, only one device maker had a transparency report and most had no future plans to publish one — leaving consumers in the dark on how these companies protect your private information from overly broad demands. Although the evidence in the Verrill case is compelling, exactly what comes back from Amazon — or the company’s refusal to budge — will be telling.